Addressing national security concerns (satellite remote sensing, space surveillance, and missile tracking). Supporting and enhancing education and public outreach. The telescope’s rapid tracking capability (10 degrees per second) facilitates studies of fast-moving asteroids, comets, and resident space objects in low-Earth orbits. Its ability to point low on the horizon enables access to targets typically observable only from the Southern hemisphere. The observatory is also used for enhancing traditional classroom coursework through laboratory observing exercises. Tours for school and community groups are conducted throughout the year to promote science education and STEM careers. Programs involving in-service teachers and curriculum development are ongoing. 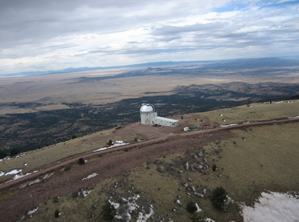 First light for the 2.4-meter telescope occurred on October 31, 2006, and regular operations began in September 2008. Major science milestones include discovering the first, second, and third fastest spinning asteroids in the Solar System, acquiring data on the variability of Pluto’s atmosphere through occultation studies, and supporting NASA’s spacecraft missions via astrometry and the acquisition of physical data of mission targets. 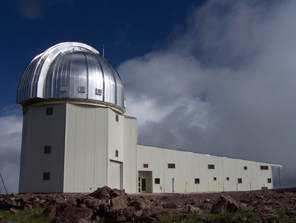 The observatory hosts a NASA-funded program to obtain astrometry and photometry of potentially hazardous near-Earth asteroids, and an NSF-funded program to determine the spin rates of Earth-crossing asteroids. Air Force-funded projects involve tracking and characterizing satellites in low-Earth orbit.